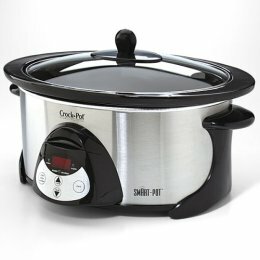 Slow-Cooker Techniques, PCOS and More! (Ep. 7) – Dana's Low Carb for Life! In today’s episode of Dana’s Low-Carb For Life, Dana shares some guidance on slow-cooking without making a pot of mush and discusses why she doesn’t always give fat grams in her recipes, talks about PCOS, presents a listener’s idea for Low-Carb convenience food, and much. MUCH more! Special thanks, as always, to Carbsmart for underwriting the show. Check them out, and tell ’em Dana sent you! Thank You so much for doing a segment on PCOS!…I have severe symptoms that are really difficult to control without eating practically zero carbs. Thanks for helping to get the word out about this devastating disorder. So glad you are back–missed you last week. Excellent episode(all of them have been great!) We suspect my daughter has PCOS so I definitely want her to hear this. Thanks so much for sharing your experience with this. And the tips for the crockpot are VERY HELPFUL! Thank you so much for the information on PCOS! My story is so similar to yours and I’m glad I’m not alone! My wonderful endocrinologist who approves of my LC and who started me on Bioidentical hormones, told me that I had PCOS that turned into premature ovarian failure. I disagreed about the PCOS because I too had NO classic symptoms, and no ovarian cysts! I do have insulin resistance, belly fat, a very hard time losing weight and I’m on Metormin too. I’m glad the pieces of the puzzle are finally coming together with the information you have provided. Thanks again, Dana! Found your podcast this past month and you have convinced me to get going again. My first low carb experience was in 1999 when I lost 45 lbs. 12 years later and I need to lose 100 lbs. Thank you for a great podcast. BTW: I am looking for your slow cooker book now. Barry, do NOT tell my publisher I said this, but buy a used copy of the original edition; save your money for the new one coming out in the fall. It’ll be 50% bigger than the old one — ie, it’s going from 200 recipes to 300. Whoops! We forgot to add the “.mp3” to the filename. Should work now. I also have PCOS. I stopped taking my metformin when I went back to low carbing 7 months ago, when we switched my 2 month old daughter to formula instead of breastmilk. I didn’t think it would be wise to take it and eat low carb together. Since then, I’ve hit a several month plateau and I’ve been frustrated. I decided about 5 days ago to bring the Metformin back to see if it’d help. My usual dose is 1500 mg but I started back at 500. I’ve had no ill effects so I plan to move up to 1000 mg soon. I was very surprised at this podcast, with our similarities! To answer your question about Sweeteners… I currently prefer Truvia. I like how it tastes, I like that it performs more like sugar in baked things, it’s easily found, inexpensive and using too much does not make your food bitter. As far as I can figure, based on what little I’ve found on the carb count of erythritol, Truvia has about 10 carbs per cup. I’m curious to know what you come up with on that. I don’t like Granular Splenda because 24 carbs per cup is just too much and it can taste chemically when a lot is used. I use the Quick Packs in Kool-aid occassionally. I did, however, just purchase the liquid sucralose to make your chocolate. Can’t wait. I really, really dislike Sweetleaf and Saccharin- blech!! I do drink diet coke as well so that’s aspartame and Ace K.
It wasn’t so long ago that I first read about Maltitol and how it isn’t such a low carb wonder. I’ve read that is is less sweet ounce for ounce as sugar as well. I can’t believe the gall of companies who ignore the carbs that come from its use in their products. In fact, I wasn’t certain I *could* go strict low carb without Endulge bars and their kin. It was a big blow to me for awhile. Hi Dana, Thanks for the great podcast! I am new to low carb living and am currently working through the Atkins Induction. My goal is to get control over my body, while I have not been diagnosed with anything, I felt like I was well on my way to diabetes or worse. I am also looking to lose about 40 lbs. So far I am doing well, I bought one of your cookbooks and have ordered a pantry full of ingredients to have on hand and I look forward to making real low carb meals instead of meat, eggs and salad. Unfortunately low carb ingredients are not available where I live so I have to wait for the mail to deliver everything. My question/problem is, how do I tame a terrible sweet tooth? I found some splenda sweetened sugar free toffees which take the edge off, but if I am going to adopt this as a lifestyle I really need to tame the tooth. Any suggestions would be very welcome. Thanks again and please keep the podcasts coming! Some of your weight loss with the egg fast might also be related to starting Metformin. I recently increased my dosage to three times a day and I have notice a huge decrease in my appetite. Have you looked in to the benefits of Spironolactone (aldactone) for PCOS, PMS and fluid fluctuations? These are prescription medications and need physician supervision, but worth finding a practitioner who is familiar with them. Thank you Dana! I’ve been enjoying your podcasts. It’s nice to finally hear your voice! Your slow cooker recipes have been a hit with a few of my clients. This is my first time listening to your podcast, thanks so much for the info! I especially found the part on PCOS very interesting. I have been on low carb for about 2 1/2 months and find I’m losing very, very slowly. I bet I haven’t lost 2 pounds yet, but feel smaller. But I noticed my blood glucose in the morning is still high! I wish I could find a Dr with half a brain! Have you heard of Victoza?